…and John is the enabling type. 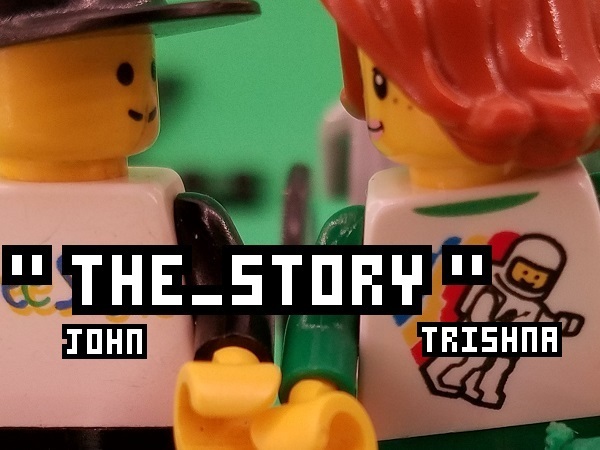 In every scene that plays in The Story’s Imaginarium where John and Trishna interact, all he wants is for Trishna to be happy. If she wants to try something new, particularly something he hasn’t considered before, he’ll always give it a try. I’m sure there are boundaries to this, but I imagine they’re few. Probably just what’s harmful or dangerous. Otherwise, for someone like John, who grew up with nothing and didn’t have many opportunities, he would gladly enable Trishna to live out some of her own imaginative adventures, whether they’re small like trying out formal dancing or large like trying out seemingly impossible things. Let’s loop back to the formal dress. Trishna is more of a traditional feminine girl with strong feminist and interpersonal morals. She has always dreamed of a big wedding and is unwilling to compromise on certain aspects of that dream. She might also secretly want someone to pamper her… just a little. When Trishna originally started talking with John online, she saw in him someone that would treat her as an equal and with an enormous respect. Likewise, and perhaps even more so, he enjoyed their conversations, so they started developing shared interests. Could that include wheelchair dancing? Trishna’s primary hobby is gardening, but that doesn’t mean she can’t have other interests. Maybe she couldn’t try dancing until they meet, went to college, and through the Accessibility Rights Club, joined a club specifically focused on dancing? Or maybe she never knew about it? It’s not a widely-advertised sport, I suppose. I don’t want to tell the same stories about the same cliché characters. When John and Trishna revealed their physical impairments to me during brainstorming years ago, I was excited! It’s been an opportunity to learn more about life outside my bubble and popular culture. Why do only what’s safe and comfortable? Life is an adventure taken at your own pace. The more you get out and try stuff, the better of a person you can become. The only limits are your imagination. Why not make something entirely new and inclusive? Picture: Generic picture to save time. Last Edited: October 31st [1 hour] – Honestly, the previous draft was an incoherent, wordy mess. Nothing flowed well. I rewrote paragraphs and it’s still not great, but, sometimes we just do what we can with what we’ve got. No need to dwell.